Master-Professor Michio Hakase is a practitioner of the Martial Sciences. He has a PHD in Wushu and Shaolin forms, and a tenth degree black belt in Physics and Nanorobotics. His mastery of physics is applied directly to his fighting arts, forming the backbone of the "Kagaku-Ryu" style. His goal is to forge the world's first "scientifically perfect fighter". To that end, he constructed a combat android, Disciple 9-1 "Ku-No-Ichi", or "Kuno" for short. Fashioned from an acrobatics and gymnastics android, the first prototype of the 9th Disciple series is programmed with every known martial arts form, as well as the 'Chakra Engine', an internal device that scientifically regulates and manipulates chi which she can use to power or transmute her body to adapt to any possible combat situation. However, as an android, Kuno lacks the necessary "fighting spirit" to properly utilize the Chakra Engine. Thus, Hakase founded the Science Dojo in Void City as a place to train and test Kuno's combat capabilities against the world's most varied and bizarre opponents. 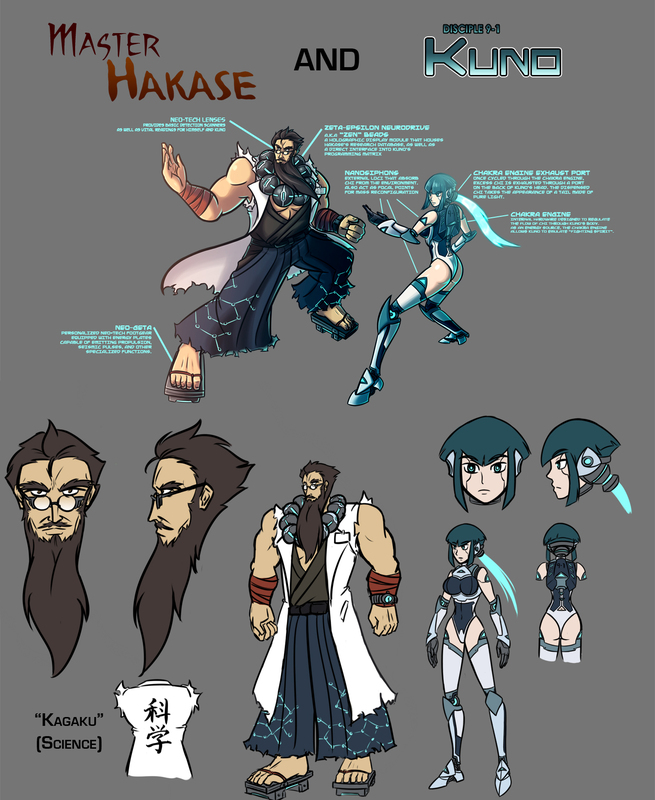 Master Hakase relies mostly on his own skill, massive strength, and scientific precision to calculate, counteract, and subdue his foes. He is lightly equipped with a few gadgets, however. The Neo-Geta are specially designed sandals with energy emitters lining the undersides, able to perform various specialized tasks such as emitting seismic pulses to generating propulsion. The Z.E.N. Beads are a portable computer interface that serves as Hakase's research database, as well as a direct interface to Kuno's AI programming, and direct control of the Science Dojo's facilities. Lastly, Hakase's glasses come with an array of basic scanners (infrared, ultraviolet, etc. ), as well as a heads-up display of Kuno's status. Kuno's Chakra Engine drives all of Kuno's combat functionality. Using various Nanosiphons placed on her body, Kuno absorbs chi from the environment, energizes the Chakra Engine, then cycles the chi outward through an exhaust on the back of her head; the recycled chi emits a blue light resembling a tail made of pure light. The Nanosiphons also act as focal points to transmute and reconstruct her nanopolymer body into different shapes and forms, allowing her to match the capabilities of non-human opponents. Kuno cannot (and will not) create firearms or explosives through the use of her Nanosiphons, as a matter of "martial ethics".